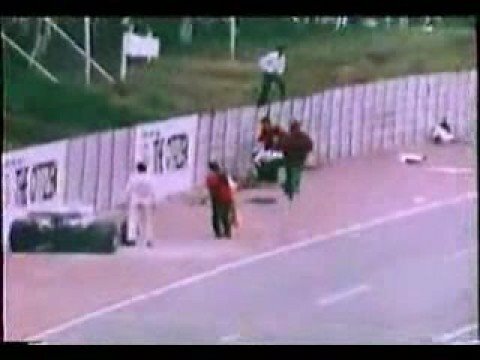 A list of graphic videos of the worst race car crashes in automotive history. Many of these crashes were fatal. Automobile racing is a dangerous sport, and this list should serve as proof of the bravery (foolhardiness?) race car drivers exhibit out on the track. Thankfully, vehicle safety technology has increased greatly throughout the years and fatalities have become much less common. This list is updated as these horrible accidents occur, including the latest such as Dan Wheldon's fatal crash. If there are any crashes I have missed, please let me know in the comments. Note that this is a list of videos, which is why crashes such as Depailler's death or Francois Cevert's gruesome crash in which he was cut in half have not been included. Drive safe. Some prefer to point to the deaths of famous race car drivers as "the worst" in history. They're wrong. In 1955, the worst disaster in automotive racing history occurred. What happened? At Le Mans, Jaguar driver Mike Hawthorn belatedly noticed his pit crew's signal to stop for gas and slammed on his brakes. The Austin-Healey behind him, driven by Lance Macklin, lost control and veered straight across the track directly in front of Pierre Levegh driving a Mercedes-Benz 300SLR. Levegh collided into the ramp, shaved the back of the Austin-Healey at approximately 150mph, and was sent airborne. Pierre was thrown from his Mercedes and killed instantly. His Mercedes slammed into a dirt embankment, and flipped over, launching the front axle, the engine, and the hood of the Mercedes into the crowd. The axle careened through the grand stand, leaving a trail of of bodies. The hood spun through the spectators like a guillotine, decapitating full groups of people at a time. The engine itself killed many as well. The Mercedes-Benz 300SLR, made largely out of magnesium (which was common at the time to reduce weight), burst into flames, and then exploded when the fire marshals sprayed water on it. In the end, 83 spectators were dead and another 120 injured. As the only driver unable to defend himself, Levegh was largely blamed. As more footage has been acquired over the past several decades, though, it is now obvious that Hawthorne and Mackliin were at fault. The first clip within the included video was likely taken by a spectator right before he or she was killed. Just a warning, this video is especially gruesome. At the 1977 South African Grand Prix, Renzo Zorzi had a problem with his car and pulled off the track. Zorzi's car quickly caught fire, and Zorzi safely jumped out. This is where the carnage began. Two race marshals decided to sprint across the track with fire extinguishers. The first marshal barely made it, but the second one, a 19-year-old named Frederick Jansen Van Buren, was struck by Tom Pryce who was driving at 170mph. Van Buren was cleaved in half, and his body so horribly dismembered that his boss was only able to identify him by summoning all of the other race marshals and seeing who was missing. But it didn't stop there. The 40-pound fire extinguisher Van Buren had been carrying struck Pryce in the head with such force that Pryce's helmet strap partially decapitated him. The fire extinguisher landed in the parking lot outside of the track, having flown over the grandstand. Pryce was killed instantly. Pryce's car continued to hurtle down the track at almost 170mph, ultimately crashing into the car of driver Jacques Laffite. For me, this is the hardest crash to watch. In Roger Williamson's second Formula One race, a tire failure likely caused his car to flip over and burst into flames. Williamson avoided serious injury, but was now trapped in his car. The inept safety marshals did not know what to do, nor were they equipped with fire proof clothing. Driver David Purley abandoned his car and sprinted across the track to save Williamson. Purley could hear Williamson shouting for him to help. Purley desperately tried to put out the fire and flip Williamson's car back over, begging the marshals to help him. While the marshals did nothing, Purley did his best, but ultimately failed as the other drivers simply drove past. By the time the fire truck arrived, eight minutes later, Williamson had already died from asphyxiation. The whole scene was broadcast on live television. 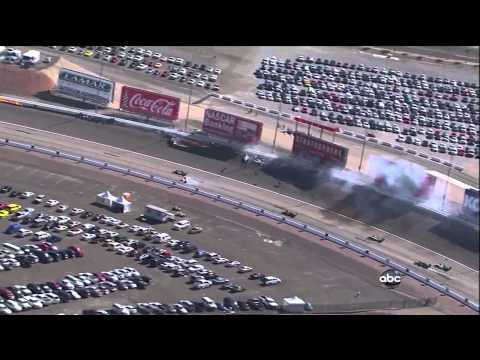 During the 11th lap of the 2011 IZOD IndyCar World Championship, two cars clipped each other, sending one airborne and the other into the wall. This resulted in a 15-car pile up, including Wheldon's. Since he was traveling at race speed when the accident occurred, his car was launched and barrel-rolled into the catch fence before landing head down. His injuries were so bad that he was unable to remove himself from the vehicle. He was airlifted to the hospital, where he died from his injuries. The crash resulted in a red-flag and the race was ended and not replayed. Wheldon was put at the top of the listings in his honor.